Using wheel locks is by far the most convenient method of securing your wheels from criminals. Unlike wheel clamps, they do not require you to install and remove them each time you drive your car as they function as a normal lug nut. The best wheel locks are the Gorilla 61631 Acorn Guard Locks, which use an outer sleeve that will rotate if a socket is forced over it in an attempt to beat them. Considering that some wheels can cost thousands, it’s worthwhile investing into a quality set of locking lug nuts to keep them safe. Not only do they keep them secure but they also act as a visual deterrent to potential thieves. 5.4 Where To Hide Your Locking Wheel Nut? The build quality of locking lug nuts is crucial in order for them to withstand severe punishment. Most criminals will hammer a socket onto locking lug nut to remove it or even try to saw it down the middle as a more direct approach. Many premium examples come with intuitive features that make the criminals task of removing the lug nuts even harder. These include rotating outer sleeves, unique locking patterns and much more. Below is a list of the 3 best locking lug nuts that will keep your wheels secure and act as a visual deterrent to prevent potential criminals even considering taking them. Gorilla Guard are a popular brand within the locking lug nut industry with a wide variety of locks available. The 61631 model in particular is completely unique with an external security pattern, which is impossible to remove without the matching key that comes with it. These Gorilla Guard locks have a clever feature where the outer sleeve will rotate if a socket is forced over it. This is excellent feature for an anti-theft locking lug which also acts as a deterrent for any car criminals looking to steal alloy wheels. Overall, they are they offer excellent value for money when compared to the dealerships and provide maximum security. Just as popular are the McGard locking lug nuts that are targeted to those with a bigger budget. They are known for being the choice for many dealerships but by buying privately, you avoid the expensive prices. McGard have been produced these for many years now and are known it’s what they specialize in. I personally own several sets of the McGard locking wheel nuts and cannot recommend them enough. They are the best locking lug nuts in terms of build quality but the lack of the rotating outer sleeve is a drawback compared to the Gorilla Guard. However, for long term usage and as a direct replacement for OEM locks, these are the best option. DPAccessories locking wheel nuts are focused on great design as well as security. Like the other locks, these are extremely unique and the brand provide a personalized security key card with a unique code in order to get replacement keys. Overall, the DPAccessories locks are great all-rounders that provide an aesthetically pleasing design that is available in a black or chrome finish. Investing into a quality set of locking lug nuts can potentially save your wheels and a replacement bill of thousands. If a criminal were to see that you have multiple locks on the wheels, they will think twice before attempting to steal them. Most people with expensive wheels will invest into two different locking wheel nut manufacturers for maximum security. Considering the low cost of these locks, it makes sense to increase the security of your expensive wheels. To help you make an informed buying decision, we have produced the below buying guide regarding wheel locks. You may be able to find cheaper locks compared with the recommendations but be warned. Below is an image of a locking lug nut that broke into piece when trying to remove the lug nut. These were cheap locks that were used by the previous owner. All of the recommendations above use hardened steel constructions to avoid this type of damage. It is highly recommended that you use a torque wrench for lug nuts when installing locks to avoid damage to the key during removal. Not every locking lug nuts will be suitable for your vehicle and using the wrong thread can cause issues. For example, if you were to use an incompatible thread, the damage it would cause and hassle of removing it is not worth thinking about. Before purchasing, we advise that you measure the length and width of an existing lug nut or alternatively refer to your vehicles manual for further clarification. There are also a range of different types of seating styles of the lug nuts too. The majority are a cone or conical seat style but some could even be a mag, flat or spherical seat too. It is worth checking the lug nuts before purchasing. Uniqueness. Unlimited number of key patterns as opposed to a manufacturer that only have around 10-30 patterns. Higher Quality. Uses hardened steel to avoid breaking the groove patterns under heavy force. Cheaper. Dealers will often charge a premium compared to aftermarket locks. Some manufacturers even use aftermarket locks but sell them as their own. If you check the small print on the locking lug nuts, you may find McGard listed. Where To Hide Your Locking Wheel Nut? Of course, having the locking wheel nut not even in the car may be safer. However, a major flaw is that you may need to remove a wheel at any given time. For example, if you have a puncture or even when having your tire changed at a garage. The removal of locking wheel nuts is not the easiest job in the world when you don’t have the correct equipment. Of course, this means that the locking wheel nut will be doing its job to prevent car criminals trying to take them off. You have two options, the first involving a trip to your local dealership requesting a key set. However, this is usually very costly and time consuming. However, if you still have the box the locking nuts came with, you will be able to match up new locking wheel nuts online with the code in the box. It is fairly simple to do but if the criminal were to do this, they would be making a lot of noise. It is worth noting that if the socket is the only one within your socket set, you may want to purchase another socket that was used. It will more than likely be cracked once performing this task. If you have expensive wheels that are not protected with a set of locking lug nuts, you are playing a risky game. They are cheap and act as a visual deterrent to criminals that are potentially thinking about stealing your wheels. We highly recommend using multiple locks to further improve your security and make it as hard as possible to remove. We have only recommended three brands, which include Gorilla Guard, McGard and DPAccessories. These three brand offer various sizes, excellent value for money and are built to last. 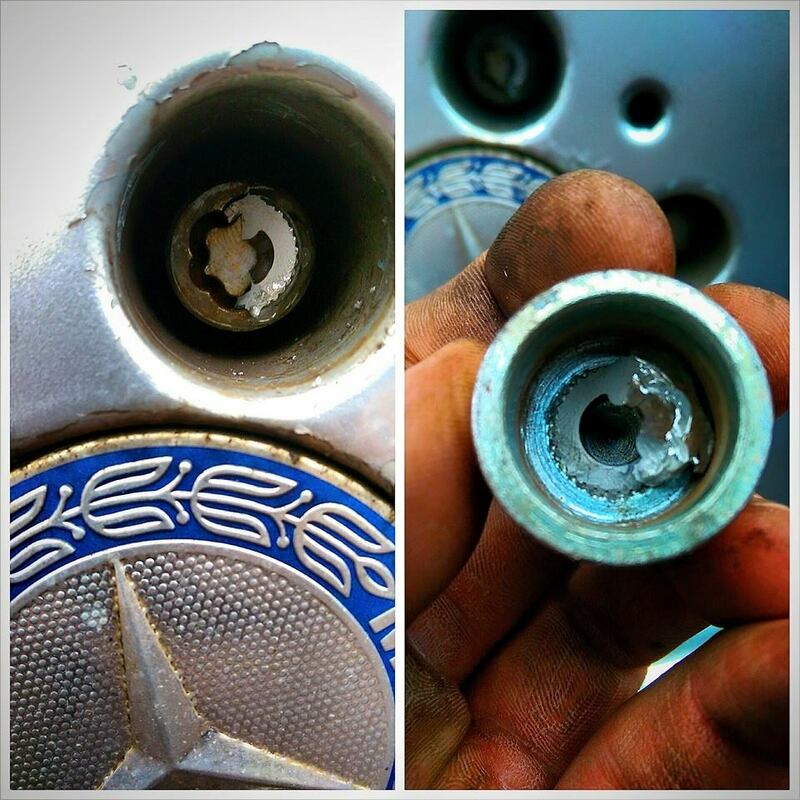 its worth mentioning that you should never let a tire fitter near your lock nuts and key with an impact wrench. One of my locking wheel nuts has been rounded off making it impossible to remove with the key (which is much harder than the nut locating spigots). Great point John! Luckily the tire fitter that I personally uses always torques it to the correct torque rating rather than just forcing an impact wrench on it! If wheel locks are from Gorilla or McGard or other aftermarket brands, will dealership be able to open wheel locks without key? Hey Paul – Well the dealerships themselves will not have the keys to unlock them. However, they are more than likely going to have a tool that can remove any wheel locks, which would be similar to what a recovery service would use too. Hope this helps.